Cellophane tape consists of a backing to which an adhesive substance is affixed for the purpose of joining materials with a surface bond. Usually, a film of cellulose (a man-made textile fiber produced from plant matter) provides the backing for adherends made from chemically treated petroleum byproducts that create the tape’s stickiness. Cellophane tape belongs to a family of adhesives known as pressure sensitive tapes: while other types of adhesives are activated by heat or water, pressure sensitive tapes adhere when only slight pressure is applied. These tapes are marketed primarily in the labeling industry, and includes such products as generic cellophane tape, masking tape, packing labels, and, perhaps the best known, transparent tape. Early adhesives—the term denotes any substance used to join discrete materials by forming a surface attachment—were made from natural substances including tree pitch, beeswax, flour paste, and vegetable resins. These primitive glues were used extensively from ancient times through the Middle Ages, when more effective glues made from animal tissues were developed. During the nineteenth century, the introduction of rubber- based adhesives provided a still more effective alternative. Pressure sensitive tapes were discovered during the mid-1800s, as scientists sought new applications for rubber. In 1845, Dr. Horace Day invented a rubber-based pressure sensitive tape for use in surgery. Because rubber possesses limited stickiness, the early adhesive tapes based on Day’s invention required supplemental tackifying agents—oils and resins added to enhance adhesion. The first adhesive tape was developed in the early twentieth century, due to a problem in the fledgling automobile industry. During the 1920s, when two-toned cars were popular, manufacturers had problems achieving a clean, crisp line between the two paint finishes. They tried using surgical tape but had problems because it did not form a proper seal and tended to lift off paint when it was removed. At that time, the Minnesota Mining and Manufacturing company (now better known as 3M) manufactured sandpaper. The firm entered the adhesive tape business when Richard Drew, a 3M lab worker who often visited the auto shops to test sandpaper, took on the challenge of finding a tape that would form a seal without damaging the car’s paint when it was removed. The product Drew eventually devised, a rubber-based adhesive coated on a paper backing, resembled today’s masking tape. According to corporate legend, the brand name “Scotch tape” was coined when a prototype batch of Drew’s tape received an adhesive coating only along its edges. This proved insufficient, prompting one irked painter to complain to his 3M sales rep about the company’s “stingy Scotch bosses.” Company executives seized upon the word “Scotch” because they hoped it would suggest that 3M tape was an economical product. After realizing that it would be necessary to coat the entire strip with adhesive, 3M began mass producing masking tape for auto painting and soon went on to make a transparent, or cellophane, tape for general consumer use. Transparent tape eventually became a household material used primarily to mend torn pages and wrap packages. The development of synthetic resins and compounds after World War II made possible great refinements of adhesive technology. Unlike Drew’s invention, contemporary tape does not yellow or ooze adhesive as it ages. It can be written on, resists water, unwinds and rewinds easily, and is transparent. Today, more than 400 varieties of pressure sensitive tapes are manufactured. Some examples include electrical tape, masking tape, packaging tape, band aids, transparent tape and labels—all available in different sizes, widths, and, in some cases, shapes. While some pressure sensitive tapes are still prepared with natural rubber, the majority are now made using mostly synthetic materials. 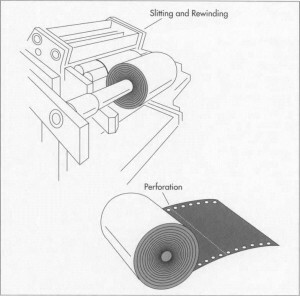 The backing for cellophane tape usually consists of cellulose acetate, a synthetic derivative of cellulose, which comes from wood pulp or cotton seeds. The cellulose is chemically treated with acetic acid and anhydride, and the side that won’t receive an adhesive coating is treated with a release agent that enables the tape to be wound and unwound without sticking together. Although this compound varies among manufacturers, some commonly used substances include stearato chromic chloride and polystearic carbonate. Prior to the application of the adhesive, the adherend side of the backing may be primed with a solvent or aqueous dispersions such as nitrile rubber or chlorinated rubber. To produce the final adhesive substance, some manufacturers use as many as 29 raw materials that go through various stages of production. However, the generic adherend is made up of acrylic resins, petroleum byproducts that are broken down into alcohols and acids before being fused into a polymer compound. This compound is then mixed with mineral spirits or a hydrocarbon solvent, creating an aqueous emulsion (a solution in which the microscopic resin particles are held suspended) that is applied to the backing. Three separate manufacturing operations are necessary to produce a single roll of household pressure sensitive tape. First, the cellulose acetate backing is prepared, and then the adhesive is made. After the two materials are combined, the final product is cut into small batches for individual consumer use, inspected, packaged, and shipped. 2 Modern adhesives differ from their nineteenth century precursors in that adhesomers, the synthetic polymers they’re based on, are inherently sticky and so require no additional tackifying agents. Such polymers are made from crude oil distillate that is chemically reacted to form alcohols and acids. These materials are then mixed with a hydrocarbon solvent that catalyzes their polymerization, the process by which they combine to form a complex molecular chain made up of repeating structural sequences. The resulting adhesomer may be used in this form or redissolved with more coating sol-vents, depending on its intended application. It is then stored until needed. 3 First, the non-adhesive side of the backing is treated with a release agent that makes the tape easy to unwind. Before the adhesive is applied to the sticky side, the side may be treated with a primer to anchor the adhesive. This coating is applied by routing the film over a large roller that rotates in an open vat of primer. As the tape moves over the roller, it applies the primer. Once these surface coats have been applied, the tape travels over heated drums (known as hot cans) that dry it. A very thin layer of pressure sensitive adhesive is metered onto the primed side of the tape, which is then rolled into long ovens for high-temperature drying. 4 Once dried, the tape is wound onto large jumbo rolls and routed over slicers that divide it into varying widths. The individual bands of tape are then wound around a small plastic core, which is next fitted inside a plastic dispenser whose serrated edge can be used to cut lengths of tape. Both tape rolls and dispensers come in a variety of sizes to fit varying customer needs. Pressure sensitive tape performance depends on three factors known in the adhesive industry as quick stick, cohesion, and adhesion. These properties must be properly balanced to achieve maximum performance. Quick stick is the tack of the adhesive where it forms an instantaneous bond on contacting another surface. The adhesive must “wet” any surface to which it is applied with only light finger pressure. The second criterion, cohesion, refers to the ability of the adhesive to remain bonded to an object without splitting when lifted away from that object. Pressure sensitive tape performs best with a high cohesive property. The tape’s stickiness, or adhesion, is commonly measured by a “peel” test that examines the tape before and after it is applied to a surface and deter-mines how it reacts to pressure and temperature changes. Additional specifications and test methods are described in documents released by the federal government, the military, and organizations such as the American Society for Testing and Materials (ASTM) and the Pressure Sensitive Tape Council. Specifications essentially describe the characteristics of the adhesive while the methods protocols address testing procedures, forms, types, grades, and sizes. As the regulation of manufacturing processes under the Clean Air Act becomes stricter, the adhesive tape industry continues its efforts to shift from petroleum-based to water-based adhesives. Manufacturers must also comply with varying state and local regulations concerning groundwater contamination and wastewater treatment. As regulatory issues become more defined with specific mandates, the adhesive industry manufacturing process will continue to adapt its technologies. Currently, adhesive tape manufacturers are concentrating on increasing repulpability, the recyclability of paper adhesives, and com- post ability, the adhesive’s ability to biodegrade. While several repulpable mills are already in operation, there are few compost- treatment sites. In 1990, the adhesive industry reported overall sales of $6.5 billion. Of those sales, $2 billion were in packaging adhesives. Experts list environmental consciousness as a big selling point, and manufacturers will seek to obtain the “environmental tag” on the products as they develop tape products that perform well while meeting environmental regulations. Dunning, Henry R. Pressure Sensitive Adhe¬sives: Formulations and Technology. Noyes Data Corporation, 1977. Katz, Irving. Adhesive Materials. Foster Publishing, 1964. Axinn, David. “High-Tech Advance,” Chemical Marketing Reporter. August 26, 1991, p. 21. Jensen, Timothy B. “PSA Tapes Offer Environmental Advantages in Packaging,” Adhesives Age. September, 1992, p. 10. Loesel, Andrew. “Sticky Solutions,” Chem¬ical Marketing Reporter. August 26, 1991, pp. 15-16. Mattes, Eileen. “Pressure Sensitive, Growth- Prone,” Chemical Marketing Reporter. August 26, 1991, pp. 17 and 20.